For several months from July of 2017 to April of this year, each day on the Archives & Rare Books Library’s Facebook page, https://www.facebook.com/ArchivesRareBooksLibraryUniversityOfCincinnati/, featured an architectural element of Blegen Library, from printer’s marks to the original floor tiles and terrazzo walls. In the way the cultural heritage of the building was presented with its sculptures and carvings representing the history of the book and the legacy of education, every detail was explored with a capsule account of its meaning and importance. The figures in the bas reliefs of “Ex Occidente Lux” and “Ex Orientale Lux” were freshly discovered. 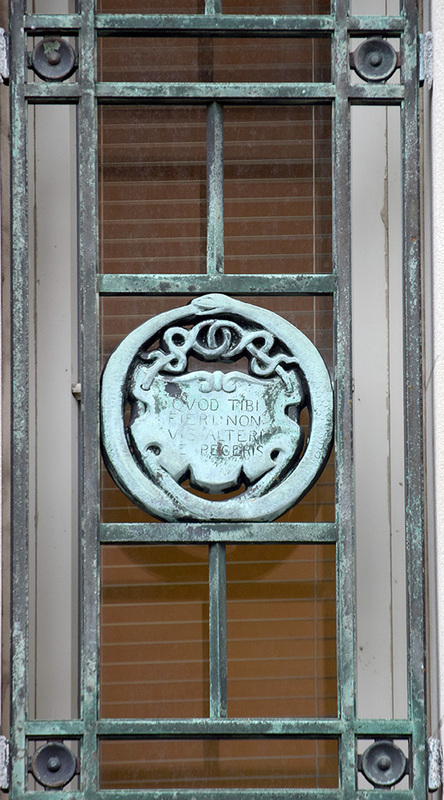 The bronze symbols of knowledge over the front door were explained. The human stories behind the plaster and bronze printers marks were revealed. 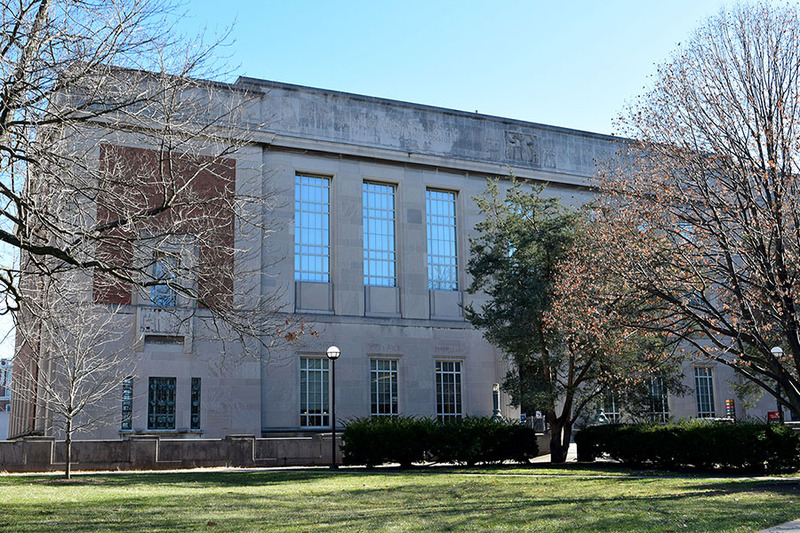 The Carl Blegen Library building is home to the University of Cincinnati’s Archives & Rare Books Library, the Albino Gorno Memorial Music Library, and the John Miller Burnam Classical Library, and with its distinctive Art Deco celebration of knowledge and the written word in its design, it is one of the treasures of campus and of the city. With the posts on Facebook, a new history of the library was written, but one design motif was not included, that of the ancient Ouroboros, the serpent that swallows its own tail. In this age-old symbol that can be traced as far in the past as a 14th century BC Egyptian funeral text, the Ouroboros signifies the cycle of life and death, the constant return of magic and knowledge in each generation. But the symbol rests with more than the ancient Egyptian netherworld, though its influence moved to Greek magic and, eventually, Western medieval alchemy. Some element of the Ouroboros is found in cultures throughout the world. In Scandinavian mythology for example, the serpent is a child of the god Loki that encircles the world. For Amazonian cultures, the snake latching on to its own tail is a symbol of the world and its creation. In India, it is “Kundalini”, representing divine power. Even in contemporary folklore, there is a touch of the Ouroboros: when I was a child, I was gifted with a stepfather who was raised in an isolated area of the Blue Ridge Mountains of North Carolina. For large parts of my childhood, Ted Miller brought us down to his family in the mountains. For example, on Grandfather Mountain he explained why the blossom of the dogwood tree has a single red petal along with the white ones and why the trunk is small and gnarled: it was the tree used for the crucifixion and was cursed forever after by Heaven. Up Stag’s Creek, he told one of many “dead mule” stories, a staple of Southern folklore. Along the New River below the fields, if you listened closely enough, the fish would tell you where they were resting in the mornings. And, he also said that a black snake or a king snake would grab its tail in its mouth and roll downhill. If you ever saw it, you were forbidden to stop its path because if the snake released its tail, our memories would be lost and the world might end. There is a similarity in this tale with mythologist Joseph Campbell’s analysis of the serpent as an archetype of creative energy and cosmic generation of knowledge. So is this part of a library’s purpose? 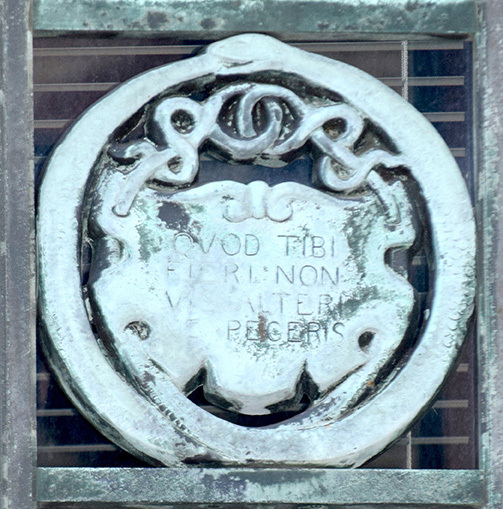 These characteristics of the Ouroboros – eternal knowledge, the circle of life, the beginning and end of time and existence, the notion of duality, the idea of giving and receiving of knowledge – fits in well with all those other decorative architectural elements of Blegen Library. The intent of these elements is to inspire students and faculty in being an integral part of education and learning for each other and of imbuing us with the responsibility of discovery and of sharing knowledge. 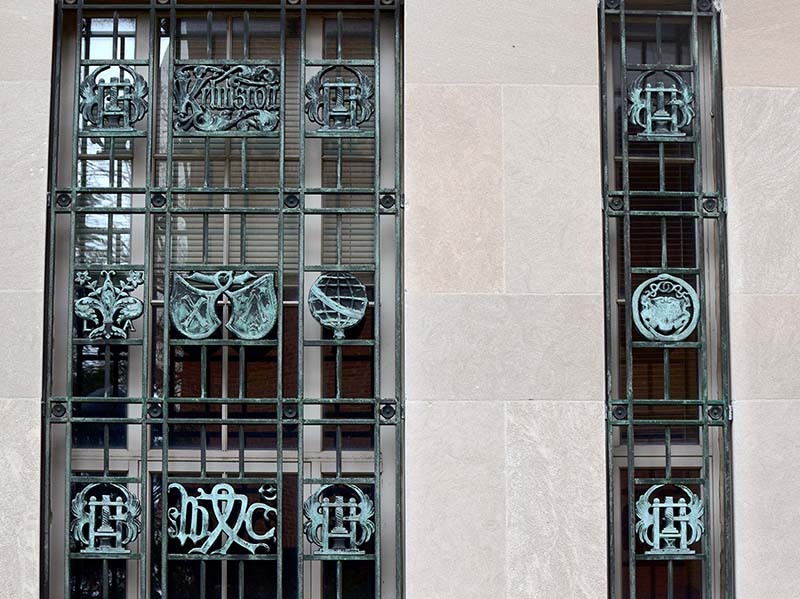 The symbols are very easy to overlook, as are many of the figures, but Blegen’s Ouroboros are found on the left panel of the window grills both north and south on the front the building. And within the circled serpent is a shield with these words: “QUOD TIBI FIERI NON VIS ALTERI NE PECERIS.” There is a slight mistake by the sculptor here, “Peceris” should be “Feceris,” the basic translation being “Do Unto Others As You Would Have Done Unto You.” Like the Ouroboros, this sentiment is also found in cultures throughout the world. So in its own way, Blegen Library in its design and function is an expression of global life and world knowledge.